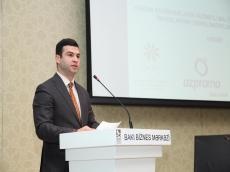 Azerbaijan’s Agency for the Development of Small and Medium-Sized Enterprises (SMEs) is planning to implement a number of measures to develop women’s entrepreneurship, Orkhan Mammadov, chairman of the Agency’s Board, said at the event “Supporting Women’s Entrepreneurship in Accessing Preferential Financial Resources” held in Baku, Trend reports Jan. 21. He noted that the Agency plans to develop incentive mechanisms for the women’s entrepreneurship. He noted that various measures will be taken to ensure women’s access to information relating to entrepreneurship in order to provide information support to women entrepreneurs. “We will support the initiative of the Women’s Entrepreneurship Development Association in Azerbaijan to create an appropriate business incubator,” he added.